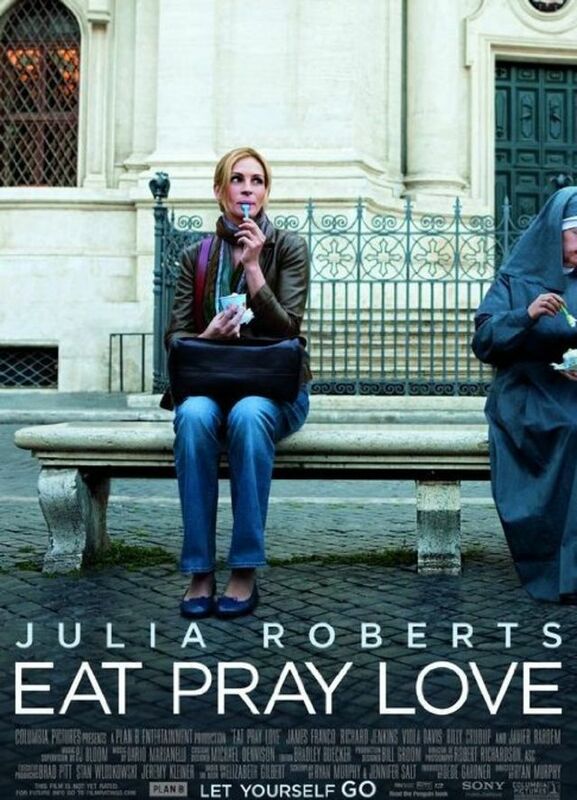 Eat, pray, love sounds like a marvelous plan if you’re hoping to overcome some midlife crisis, or quarterlife in my case. This film’s main character, Liz (Julia Roberts) does a lot of all three when she decides to step away from her life as a married, well heeled writer and take an adventure around the world. This is a good approximation of my life, except the part about being married, well heeled, or a writer. Basically, I wanted to step away, and that put me in a vulnerable position to enjoy the movie, the sort that I normally wouldn’t watch because I have an aversion to self-help memoirs, or whatever genre you want to classify the same-titled book on which Eat Pray Love is based. Elizabeth Gilbert’s 2006 bestseller chronicles her struggle to “find herself,” and this adaptation will resonate with those are feeling a bit unmoored. It dips into some of the dark spaces where one is wont to confront fears and failures. Liz must reconcile the fact that her fickle husband (Billy Crudup), a man she loves and has been married to for eight years, is not the man for her, nor perhaps is the younger man (James Franco) she begins seeing after her divorce. That in turn has her questioning the map of her life, including her chosen career and the values and lifestyle that favors. One can argue that’s a good problem to have; if I was a published author who mingled with the East Coast intellectuals and whose work featured in national magazines, I would be writing about existential crises, not having one. But Liz is deeply dissatisfied and not the type to just talk out her problems. A girl’s night out will not do it, and why should it when you have the money to quit your job and jet around the world for a year? Her funding, in reality, came from an advance, so let that knowledge settle where it may. For me, this information reinforced the artificiality of the project. Of course an attractive white woman would find enlightenment abroad, especially where brown people congregate in steaming huts without the benefit of air conditioning. Her journey is neatly packaged – delight in culinary pleasures in Italy, gain discipline through prayer in India, and reawaken her heart on the coasts of Indonesia. This at least turns the film into a glossy travel and eats brochure. There’s a lot to coo at, such as the sumptuous tight shots of food – pastas, pizzas, and pastries galore – that forced me to hide my cider and popcorn in shame. The camera also plays with bold color palettes – fuchsia and gold at an Indian wedding and then a verdant palm tree grove in Bali. The photography alone arouses the senses, a way of stirring you out of your Netflix-induced coma. But for all its well placed truth baubles, I couldn’t shake the feeling of being duped. I like collective life wisdom with a glass of wine. I like the idea of a guru, though not mystical or exotic or, by those definitions, necessarily Asian. I like nervous, disastrous starts of true love. I even like crusty old men played by Richard Jenkins who turn out to have a deeply buried soft spot. But for a movie about a woman in a right emotional and spiritual mess, there are too many clean lines and compartments. The film works if you accept Liz and her enlightened sermons on self-fulfillment at face value. I don’t always, so fellow cynics, beware. Posted in USA, Western movie reviews and tagged Billy Crudup, James Franco, Javier Bardem, Julia Roberts, Richard Jenkins, romance, Viola Davis on April 28, 2016 by limmer13. 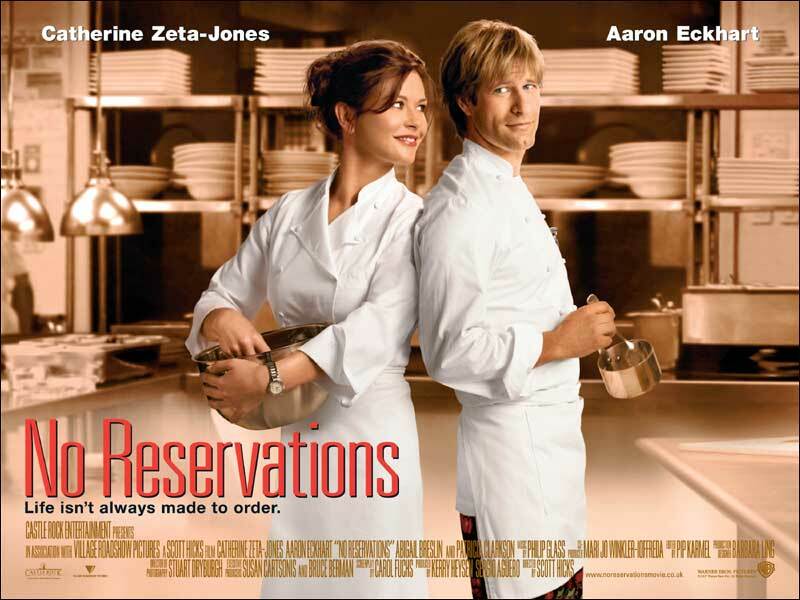 No Reservations doesn’t aim for anything flashy, which I consider a positive goal, but its unimaginative title and low-key approach to a kitchen romance make this a forgettable film. Still, it’s better than I expected. I thought it would be something along the lines of Love’s Kitchen, but classier. Instead, it is based on an acclaimed German film, Mostly Martha, and centers around Kate (Catherine Zeta-Jones), the head chef at a chic New York restaurant. Her exacting nature allows her to excel at her job but that comes at the expense of personal relationships. Her boss (Patricia Clarkson) forces her to attend therapy so that she can work on people skills, but she uses the time to expound on food and cooking. The sudden death of her sister changes everything. Previously accepting if not exactly content with her solitary lifestyle, Kate now finds herself caring for her nine-year-old niece, Zoe (a captivating young Abigail Breslin). It’s not all fireworks at first, and the film provides a window for Kate and Zoe to reacquaint themselves and adjust to their new relationship. It’s also gives the audience a chance to see Kate peel back some of her steely exterior. Zeta-Jones is affecting in places, like when she retreats to a pantry before breaking down in front of her boss. The movie never brings us close enough to her inner state though. Here is a woman who so tightly controls every aspect of her life that she hits back at anything she finds disagreeable. When a customer complains about the food, she insults him; when her neighbor tries to get closer, she rejects his overtures. Now it’s Zoe’s needs and Kate’s own grief that begin to dictate her life – and she isn’t quite sure how to handle these unknown quantities. There is an overall sense of frustration and confusion, like when Zoe refuses to eat and Kate doesn’t know why or what to do about it, but those feelings don’t manifest in many tangible ways. The film offers up a lot of glassy-eyed and forlorn gazes as an alternative. The emotional distance is not just between her and the audience though but between her new sous chef, Nick (Aaron Eckhart), as well. The two are a handsome match and partake in some obligatory bickering when they first meet. Kate dislikes his easy-going manner and penchant for opera in the kitchen but softens when he begins to connect with Zoe. The relationship eventually progresses towards a predetermined conclusion, but there’s no rush to get there. Surprisingly, this languid pace doesn’t slow down the movie and in fact gives it a sheen of realism. It does make the characters feel less important, however. Kate’s journey opens herself up to different roles and forces her to reassess those responsibilities and commitments. It’s gratifying to see a woman grapple with what is essentially a three-person love story, but it’s one that needs to be tightened to have any lasting resonance. Posted in USA, Western movie reviews and tagged Aaron Eckhart, Abigail Breslin, Catherine Zeta-Jones, romance on April 24, 2016 by limmer13. 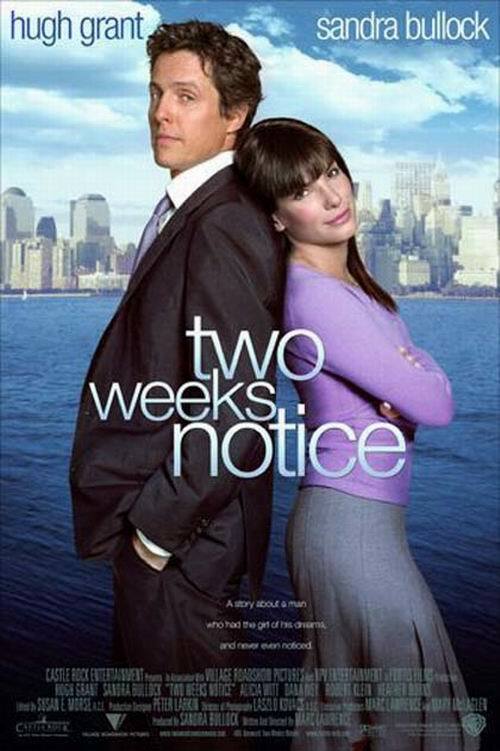 Two Weeks Notice is a romantic comedy that has neither romance nor comedy. It does boast an enviable pairing in Sandra Bullock and Hugh Grant, but that’s a match that works only in theory. The actors share little chemistry and are saddled with a script so inert that you’ll be wanting to hand in a two minute notice. Bullock stars as Lucy, a progressive, lawyer, and Harvard graduate who tries to stave off gentrification by riding wrecking balls (whilst fully clothed). When she learns that a beloved community center is slated for redevelopment, she confronts the devil himself, real estate mogul George Wade (Grant). Rather than getting the brush off, she is offered a job as lead council and accepts, on the condition that he will save the center and that she will get company funds to develop her own community projects. If you believe someone who regularly handcuffs herself to demolition sites would willingly crawl into the belly of the corporate beast, then you’re halfway to enjoying this movie. Before long, Lucy finds herself morphing into George’s personal assistant. She gets called out of a wedding because he can’t figure out what clothes to wear, just one sign of his growing dependence on her, and his general immaturity. When she decides to quit, she discovers that she is unemployable; he wants her to stay on, and other firms don’t want to cross him. It’s an absurd premise to overcome, and frankly, the movie doesn’t. That Lucy and George appear to be a well matched comedic odd couple should help. She is straight-laced and laser-focused while he hires beautiful lawyers who barely passed the bar just so he can bed them. He’s also not particularly good at his job, bumbling Hugh Grant that he is, and often defers to his older brother (David Haig). When that doesn’t work, he leans on his black best friend who speaks in metaphors comparing women to chess. Neither actor seems to enjoy their part. The characters don’t stand out as individuals and thereby lack the strength to play off one another. Grant’s flirtatious glances aren’t enough to catch fire, and the film tries to make up by manufacturing romance elsewhere. A few scenes show the couple – how shall we put this – working through adversity but are really no more than juvenile toilet humor. When the two do reach some point of reconciliation, it’s not emotionally rewarding. Lucy lost me when she started working for George, and I fell completely off the wagon when she got jealous while training her flirtatious replacement (Alicia Witt). As for George, I was never invested enough to believe or care whether he would grow a conscience. Interestingly, the character who most caught my attention was Lucy’s mother (Dana Ivey), herself a formidable legal mind and one of the best in the country if her daughter is to be believed. There’s a tiger mother story underpinning this relationship, and it’s one that Bullock seems more committed to playing and one that I’d be more committed to watching. Posted in USA, Western movie reviews and tagged Alicia Witt, Dana Ivey, David Haig, Hugh Grant, romantic comedy, Sandra Bullock on April 22, 2016 by limmer13. In 1950, a failed push for Scottish home rule prompted four university students to carry out a daring stunt in the hopes of restoring national pride. The young turks, fearing their countrymen had become resigned to the fact that Scotland was simply “North Britain,” wanted to jolt the nation out of its complacency. The best way to do that – steal the Stone of Destiny, a lumbering block of sandstone that had been used during the coronation of Scottish monarchs for centuries, until it was ferried off to merry England by Edward I. In hindsight, this probably wasn’t the best plan but it worked, which is sort of the opposite trajectory of this movie. There’s a great sense of purpose here, a rousing feeling of national pride rippling through the decades. Watching post-referendum, and post-Outlander (sorry not sorry for my excessive references to that glorious show), I can’t help but to ascribe a more audacious political agenda to it. But Stone of Destiny isn’t a call to arms and maybe was never meant to be. Willing it to be more than it is doesn’t change the fact that even at its very best, this is merely a pleasant film. In a way, it lacks the boldness of the event and of those who carried it out. 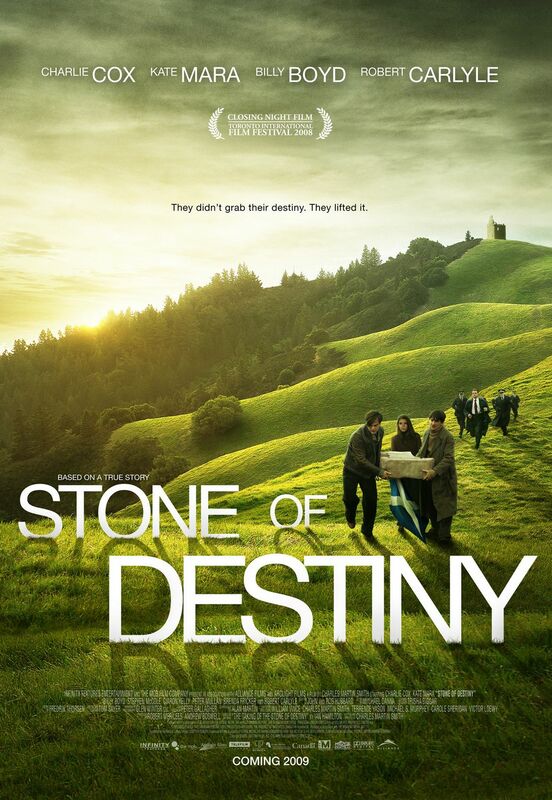 Stone of Destiny never feels very consequential because it’s treated like a run-of-the-mill caper with added doses of nationalism. Inoffensive and bumbling, it’s a comedy of errors. Here are four students, led by Ian Hamilton (a likable Charlie Cox), who are about as clueless as they are patriotic, at least when it comes to stealing national treasures. They pose as tourists to case Westminster Abbey, where the stone is tucked snuggly into the Coronation Chair, and, since this is low-tech 1950s, just hide until the lights go out. It’s an admirable endeavor, and there’s definitely a charm to the whole affair. At one point, Ian approaches politician John MacCormick (Robert Carlyle) for some funds and gets thrown out when he requests a measly £50 – for petrol and fish and chips. The overall tone of the movie is almost too genial and lighthearted though, and it rarely registers any real tension. Their run-ins with police officers and guards are both perfunctory and predictable, with nothing to fill in the gaps between those brief flashes of suspense. I kept waiting for a more sustained charge that mirrored all the enthusiasm and anxiety that they might have felt. The attempt to cast the students as young idealists in conflict with adults comfortable with the status quo isn’t particularly strong either. Cox finds a hurt puppy in Ian as he gets upbraided by his father for wasting his life on dreams of devolution, but the script doesn’t give room for the actor to expand. Ian’s best friend (Billy Boyd) succumbs to practicality and withdraws when he realizes he could get kicked out of school, lose his fiancée, and be imprisoned. All are serious considerations, and all are dismissed in a pivot towards the students who do end up carrying out the theft. But even those characters, played by Kate Mara, Stephen McCole, and Ciaron Kelly, are only sketches that rely on one or two distinguishing traits. Guess it’s back to Outlander for my Scottish fix. Posted in UK, Western movie reviews and tagged Billy Boyd, Charlie Cox, comedy, Kate Mara, Robert Carlyle on April 22, 2016 by limmer13. There comes a point in your adult life when exchanging numbers with a stranger is the sensible thing to do. If you’ve spent the evening sharing desserts and skating under the stars, we’ll assume he doesn’t creep you out and that he in fact has a good chance of being normal. Maybe you call him back, maybe you think about it for a few days and then decide you like your boyfriend better, maybe you leave his number stuffed in your purse for another month. Whatever you do, it’s about options. You most certainly won’t brush off the encounter and go on your merry way. Unless you are Sara Thomas (Kate Beckinsale) and exist in some hyper-adolescent fantasy where life happens only because stars align and pixie dust sprinkles down from the sky. She meets nice guy Jon (John Cusack) when both try to buy the same pair of gloves during the Christmas rush at Bloomingdale’s. After chatting away the evening, he asks for her number, and she, not at all cognizant of how fate works, demurs, arguing that if they are meant to be, they will meet again. He writes his number on a $5 note and she writers hers inside a copy of Love in the Time of Cholera, of course, and they wait for chance to do the rest. At this point, you’re allowed to scream at the telly or turn to something more realistic, like Love, Actually. It’s maddening to see an otherwise intelligent woman cede control of such a major part of her life. It’s not that she isn’t looking for love or doesn’t care about it but that she clings on to a highly romanticized notion of how it works. An unexpected meeting with someone you get on with during one of the busiest times of the year seems pretty serendipitous to me, but what the hell do I know? The answer is not a lot. 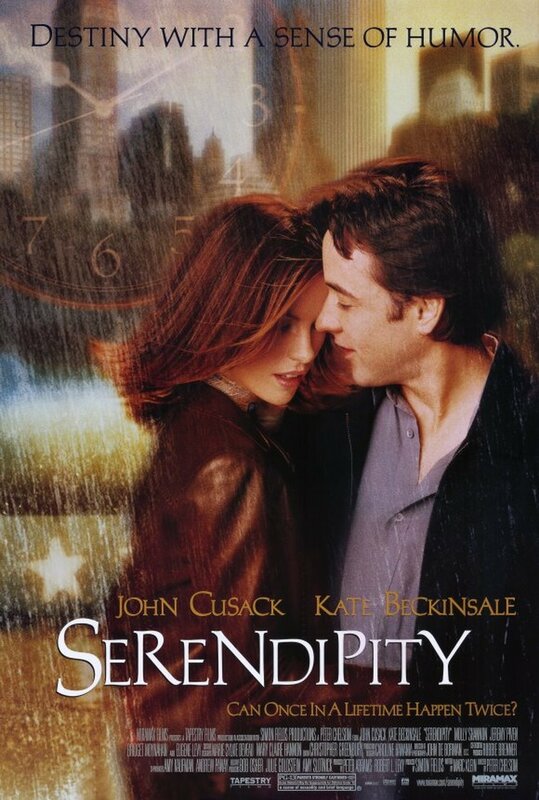 The movie skips forward several years later, and the two strangers are engaged to their respective partners. Sara is ready to tie the knot with Lars (John Corbett), a spacey new age musician, and Jon is about to marry the very beautiful Halley (Bridget Moynahan). Their sudden reluctance to head down the aisle sets off a string of chance encounters, near hits, and just so many coincidences that all subtlety vanishes, taking the magic along with it. I found it impossible to sympathize with such stubborn people, despite or perhaps because Beckinsale and Cusack consistently pull off sensible characters. Not only did Sara’s initial stunt turn me off, but her continued insistence on leaving things to fate was equally nonsensical, as if its magic hands would swoop down and arrange everything in its proper place. Jon didn’t engender positive feelings either when I saw that he was still clinging onto the memory of a girl who so readily played his heart. Who has time for these games? There are so many better options out there. Posted in USA, Western movie reviews and tagged Christmas movies, Jeremy Piven, John Corbett, John Cusack, Kate Beckinsale, romantic comedy on April 19, 2016 by limmer13.